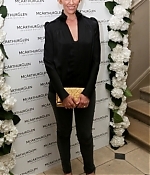 Yesterday, Toni has attended the McArthurGlen Designer Outlet Fashion Month Launch Party in London. Pictures from the event have been added to the gallery. Toni is currently in London to shoot “The Long Way Down”.